Cooking fills a kitchen with delicious scents. But sometimes, an excess of grease or a slightly smoky oven can be more trouble than its worth. In moments like these, you need a range hood to take care of the problem. 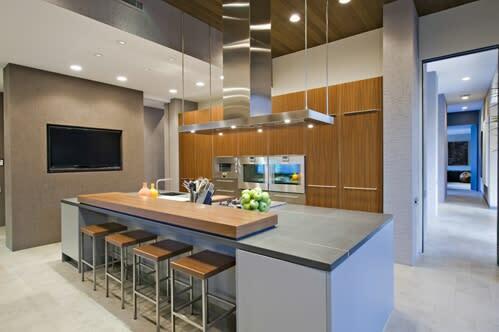 But what kind of high-end range hood fits best with your kitchen? Before you invest, make sure you take various styles into account. There are three basic kinds of range hoods you can choose from – chimney, downdraft ventilation and under-cabinet hoods – all of which will get the job done, but with varying efficiency depending on your kitchen and cooking style. Chimney range hoods are a unique part of your kitchen, as they're as much a decor fixture as they are an appliance. They attach to the wall above the range and have a flue – just like a traditional fireplace and chimney – that climbs the wall through the ceiling. You'll lose out on some cabinet space, but for large kitchens the chimney hood is a great aesthetic and functional kitchen addition. Like a fireplace in the living room, it offers your kitchen a focal point. Downdraft ventilation takes a different approach. Instead of letting air vent upward away from the range, the fumes are pulled downward and out of your home. The real bonus is that you don't suffer for storage, so these units are handy for smaller kitchens. They're also useful for island cooking – when you don't want to block the view with a chimney unit – or for ranges in front of windows. Under-cabinet hoods are a lot like chimney hoods, but with some of space saving qualities of the downdraft ventilation models. These units attach to the bottom of the cabinets above your range, but allow you to continue using your cabinet space above, as usually the duct goes directly out the back or takes up only a portion of the upper cabinet storage space. One of the first things you need to think about when it comes to purchasing a range hood is what kind of ventilation your kitchen requires. Many hoods have ducts that ventilate outside, which is commonly recommended as it completely removes all fumes. Exterior exhaust ducts are easier to install and require less powerful fans when your range hood is mounted to a wall, especially one facing the outdoors. The other option is to go with a duct-free model, which purifies air through a charcoal filter and then releases it back into the kitchen. These models require you to change filters from time to time. One of the key terms to remember when you're shopping for a range hood is "cubic feet per minute" – or CFM. This is the power measurement for how quickly your range hood moves air. Higher CFMs are more powerful and can remove grease fumes, steam or cooking smoke at a much higher output. Higher CFMs may also be necessary for hoods that have to push air further to exhaust it from the home. Some towns and cities have restrictions on CFMs allowed in residential appliances, so be sure to double-check what's legal for you. Range hoods aren't the most exciting kitchen purchase you'll make, but they're a smart investment with some serious aesthetic bonuses. As you're shopping around, make sure you pick a model that works well with your kitchen's sense of character and style. Once you've found it, get cooking and never worry about lingering garlic and onion smells again!